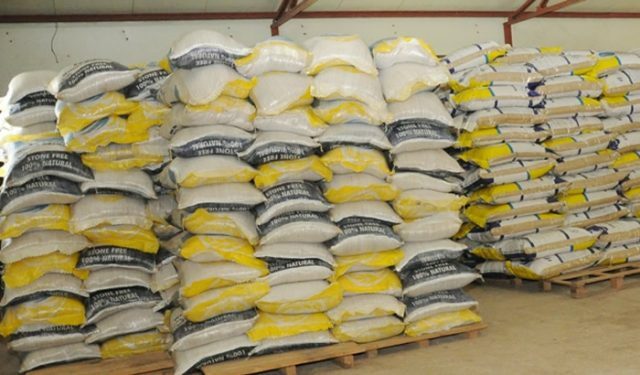 Thousands of Lagos residents, Thursday, besieged various centres across the state to buy LAKE rice, a locally produced rice borne out of a partnership between Lagos and Kebbi states. The governors of the two states, Akinwunmi Ambode and Atiku Bagudu, had launched the rice on Wednesday with the aim of ensuring food security as well as show Nigeria’s ability as a producing nation. According to the Lagos State government, the rice would be sold at N12,000, N6,000, and N2,500 for 50 kilogramme, 25kg, and 10kg bags respectively. Correspondents who monitored the sales of the rice across the three Senatorial district‎s in the state reported a mix of elation and disappointment from the residents. At the Ikeja Grammar School, Oshodi, almost 400 people had gathered at the centre by 10 a.m. while the truck conveying the bags of rice arrived at 12:30 p.m. An intending buyer was issued a slip to go make payment at a Zenith Bank branch at Bolade, some metres away, and return with the slips and a bank teller before receiving a bag of rice. At the St. Agnes Nursery/Primary School, Maryland, intending buyers‎ turned up as early as 7 a.m. to await the sales of the rice which began three hours later. Accreditation was done and people were issued bank tellers to go make payment at a nearby Zenith Bank branch. It is gathered that some of the almost 300 buyers had already put down their names on Wednesday and got a head start ahead of the others. “As you can see, there is no POS, no ATM for payment. Bank officials are not even here,” Mr. Adekoya said. Abiola Bashorun, another resident, said the rice would go a long way in helping Lagosians out of the current economic recession, adding that it would help those who can’t afford the commodity in the market. “But government should make the payment system less stressful,” Miss Bashorun added. At the Teslim Balogun stadium in Surulere, some buyers who arrived early said they would love to see the bags of rice before making any kind of payment. ‎Adekunle Olutayo, who owns a shop near the stadium, said he would confirm the quality of the rice before parting with his money. “I am surprised that people are rushing to pay for an item they have not even seen,” Mr. Olutayo said, just before a consignment of the rice arrived. But another trader, Ajoke Badmus, said she had no reason to believe that the state government would deal in sub-standard products. “I have paid already,” Mrs. Badmus said. It was, however, not all tales of glooms at the centres where the rice was sold. Muyideen Alanran said he was glad to be among the first to purchase the rice at the Ikeja Grammar School, Oshodi. “I thank the State Government for giving us the opportunity because when we go outside,we know the cost of rice, but we thank the Lagos State Governor for this opportunity and we hope that more would be made available so that the process of purchasing would be easier,” he said. “I will like to tell Lagosains that this is for real. If they get to any of the centres, they should queue orderly and they will get the ‎rice,” she said. At Mobolaji Johnson Sports Centre (Rowe Park) in Yaba, residents were seen queuing orderly to buy the commodity at government approved prices. Another resident, Alabi Aminat, who spoke to journalists after buying the product, said the development was a thing of joy, as there ‎was no discrimination in the sale of the commodity. “I got here this morning and I was told I could pay through the POS and I did,” she said. “The process was free and fair and the most commendable aspect is that the people in charge of selling the rice are not particular about whether you work with Lagos State Government or you belong to any tribe or creed, as long as you are a resident of the state, you are entitled to buy.